On Saturday Aaron, Rachael and I took a day trip to the Oregon Coast. We decided to go to Cannon Beach, Seaside and up to Astoria. On the way home we drove along the Columbia River.The weather was ideal for our trip, probably mid 70’s and the coast was quite breath taking. Cannon Beach was our first stop. Not the typical beach of the pacific coast. I was picturing warm waters, sandy beaches (which there were), sunbathers, etc. Instead, there were kites. Lots of people fly kites due to the high winds on the coast. A cool little fact about Cannon Beach is that there is a large set of rocks that were featured in the movie The Goonies. Then we drove up highway 101 to Seaside, which was a dump, so we went straight to Astoria. We had some coffee at the Coumbia River Coffee Roasters Co. The cafe was very tranquil and nice. They had all the roasting machinery right in plain sight, which was neat to see. After coffee we decided to see downtown Astoria. We were in search of a good cup of Clam Chowder. We ended up at this small smokey place called Andrew & Steve’s. They had exactly what we were looking for-a relaxed atmosphere, locals, friendly service and clam chowder! After a late lunch/early dinner we took a walk along the Columbia River waterfront where we saw an enormous container ship. For reference, if you look closely in the photo you can see a small tugboat along side the tanker which itself is probably 25-30 feet long. 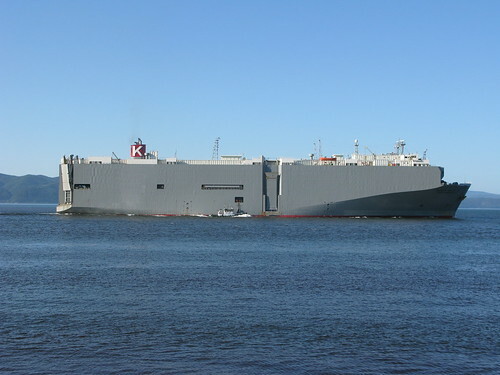 The ship was very impressive, I’ve never seen anything that large that floats. 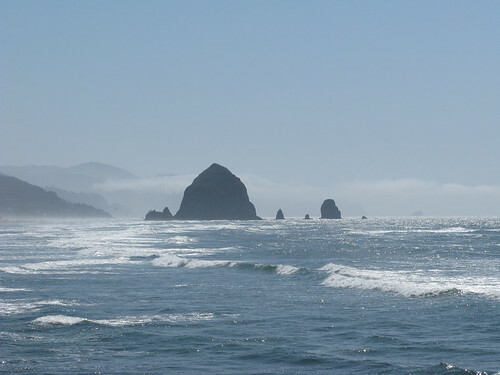 This entry was posted in Uncategorized and tagged Astoria, Cannon Beach, Columbia, Container Ship, Goonies, Oregon Coast, Photos, River, Road trip, Seaside. Bookmark the permalink.